Combine 1 liter of water, sake, mirin, and salt in a large saucepan, and bring to a boil. Combine onion in a small bowl covered with cold water mixed with the vinegar. Set aside for at least 10 min to remove its bite (you can use it raw if preferred), then drain and squeeze dry. In a large mixing bowl, combine greens, daikon, cucumber, grapes, shiso, and soaked onion. Once the water has reached a boil, add pork and remove about 10-20 sec after. If it’s thin, it will take barely any time to cook. After, submerge in cold water. 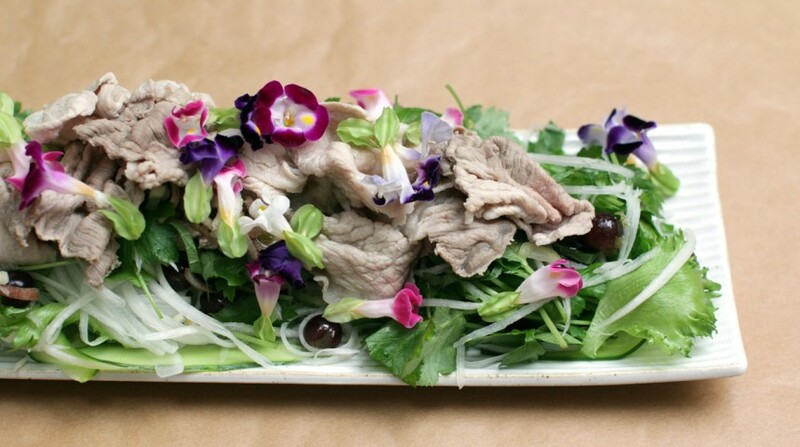 Arrange the salad on a plate, top with pork, pour over dressing, and scatter with myoga.